We provided Clean Jordan Lake a 30 yard dumpster for their Annual Fall Trash Cleanup through our dumpster donation program. Wait until you see the results. Every community faces challenges but is also home to groups of people willing to volunteer their time and effort to overcome those challenges. 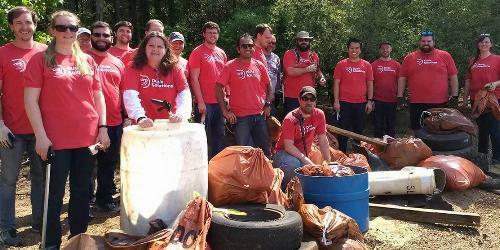 When these groups set out to clean up littered streets, polluted rivers or blighted properties, we’re happy to help out by providing dumpster donations. Check out some of our most recent donation stories below. To learn more about requesting a donation, visit our Corporate Citizenship page.